Welcome to Digital Digest! 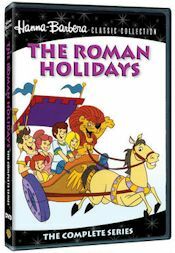 Today, we've got all of your regular features, as well as a review of the Hanna-Barbera series about an animated family living in ancient Rome in The Roman Holidays - The Complete Series. Let's get started! CBS has had a trend of wrapping up series that once seemed abandoned on DVD, and this week, a listing showed up on amazon.com that suggests that we'll be seeing the last season of a popular sitcom on DVD very soon. No release date is given just yet, but Family Ties - The Seventh Season is now available to order before it is released. Of course, we'll have more on this release once we have more information. Fox is serving up some more burgers with this week's surprise release of Bob's Burgers - The Complete 2nd Season on DVD. But don't look for this release in stores. Fox has decided to go the manufacture on demand route with this one, and it is available exclusively as a CreateSpace title on the website for the time being. Several months ago, we mentioned that Shout! Factory had obtained the rights to the series Fridays, and would be releasing it on DVD. At the time, though, there was no word on exact plans... but now there is a confirmed release for the series! On August 6, Shout! will release The Best of Fridays, a five disc collection that will include 16 episodes of the series. Tuesday (May 14) is a big day for releases, but they're all re-releases (although a bit better than the original releases), and all come from the same studio: Mill Creek. First up, Roseanne is completed (again) with Roseanne - The Complete Ninth Season and Roseanne - The Complete Series. That '70s Show gets another complete series release with That '70s Show - The Complete Series. And finally, 3rd Rock from the Sun gets the complete series treatment with 3rd Rock from the Sun - The Complete Series. That completes the run for all of the Carsey-Werner sitcoms that Mill Creek had the rights to release! If you're interested in something other than sitcoms, though, Mill Creek starts another series, with their release of Highway to Heaven - The Complete First Season, which will feature unedited episodes (previous releases of the series from another studio included edited episodes). Somewhere between the pre-hysterical Stone Age of The Flintstones and the fantastic future of The Jetsons lie The Roman Holidays. In the early '70s, the animation team of William Hanna and Joseph Barbera dominated the TV cartoon industry, and while they had many hits, some of them didn't quite work out. One of those ones that didn't work out was the NBC Saturday morning series The Roman Holidays, a series about a "typical family" living life in 63 A.D. It was a premise similar to that of The Flintstones, but at a much later time. Father Gus Holiday (Dave Willock) and mom Laurie (Shirley Mitchell) are the heads of the Holiday family, keeping an eye on teenage son Happius (Stanley Livingston) and daughter Precocia (Pamelyn Ferdin). Living at the Venus de Milo Arm, they face constant threats from landlord Mr. Evictus (Dom DeLuise) and trouble from Gus' boss Mr. Tycoonius (Hal Smith). And of course, like all animated families, they have a pet... and this one is a lion named Brutus (Daws Butler). The series begins with "Double Date," where Gus heads to the prom (in disguise of a teenager). Somebody in the house is being a bit of a mooch in "The Lion's Share." The family goes to a concert in "Star for a Day," but what they see on stage may not be quite what they expected. Gus and Laurie are forced to do a bit of cross-dressing to save Gus' job in "Switch is Which?" The family takes a little vacation in "Hectic Holiday." In "The Big Split-Up," Hap faces an upset in his romantic life when she thinks that he is dating a beautiful lion (except she doesn't know it is a lion). Gus has to decide whether to go to a bowling tournament or attend his daughter's drum recital on the same night in "Double Dilemma," but his ultimate plan is the set up for the typical disaster in these situations. The family could be losing their freeloading laugh lion in "That's Show Biz." In "Father of the Year," there is a lot at stake when Gus and Mr. Evictus compete against each other for a coveted award. The series ends with a take on the classic Cyrano de Bergerac tale (even though he didn't live until about 1600 years later...) in "Cyrano de Happius." The packaging for this set is in a standard Amaray case, with an extra tray inside to hold the extra disc. On the cover, there is a picture of the entire family in a Chariot (being driven by Brutus), and on the back, there is a photo of the family at the zoo. Inside, the two discs have the same photo of the family as seen on the cover. Also, it is important to note that these are true MOD (DVD-R) discs, and not pressed DVDs. The menus on the set are very basic, but at least they look nice. Each menu has the picture of the family at the zoo, with Brutus playing the guitar. All of the episodes are listed, along with a Play All option. Once you select an episode, it plays immediately. Chapters are placed throughout each episode. The video and audio quality of the series on DVD is actually pretty decent. I was expecting the worst, since this is one of the more "rare" cartoons in the Hanna-Barbera library, but everything looks and sound pretty clear (aside from the choppy animation, which is almost like an artistic trademark of any Hanna-Barbera cartoon). Unfortunately, there are no subtitles or closed-captioning. Like most Warner Archive releases, there are no special features. This really is a fun series, and I enjoyed watching it. However, I can understand why it didn't go over too well. The Flintstones took place in the very distant past and The Jetsons took place in the very distant future, and everything on those series made plenty of sense to people... one had to improvise everything, and the other had all of the technology that they needed. This series, however, takes place somewhere around the middle of those, in the days of the ancient Romans, and it almost requires a bit of history knowledge to really understand that. On top of that, this series was targeted towards kids. But it is important to reiterate that this actually is a good show, and it is just another example of the great work of Hanna-Barbera. As for the DVD set itself, Warner Archive did a fine job with everything, and there are no real complaints. I'm just glad that the program exists, because we probably would have never seen this series otherwise. Who to Follow: Fran Drescher (Twitter), "Fran Drescher's official Twitter page." Claim to Fame: Drescher started out with very humble beginnings in acting, with a few movie roles and guest starring roles in series, but she became best known in 1993 when her hit sitcom (co-created by then husband Peter Marc Jacobson) The Nanny premiered on CBS. Once that series left the air in 1999, she went on to a few more movie and guest star roles, until finally landing in the TV Land sitcom Happily Divorced, a sitcom that was co-created with now ex-husband Peter Marc Jacobson (and based upon real life). Why You Should Follow Her: Not everybody is a fan of Fran Drescher's voice, but regardless of what one thinks of her voice, she is a great actress and a great person... and she is somebody that you'll want to follow on Twitter. She keeps up with what her fans want, and she is very good at keeping her fans informed about everything that she is doing, which includes some things that are part of her acting career and some things that are part of her cancer advocacy work, an issue that she cares about deeply. And, if you do like her voice, you can almost hear it in reading her Tweets, which actually makes reading them very fun.